The robust and versatile Hewlett Packard T2500 914mm Designjet eMultifunction printer is aimed at businesses that deal with commercial printing services. The HP Designjet T2500 914mm PostScript eMultifunction is designed to improve the workflow with versatile media handling and enhanced print speeds, as well as to enhance productivity with easier ways to share and manage various content and handle multiple jobs at the same time. The HP Designjet T2500 PostScript all-in-one prints, scans and copies. It measures 1399mm wide, 1110mm tall, and 916mm deep, and weighs 112kg. It runs on 128GB of memory with a 320GB hard disk drive. The Designjet T2500 PostScript printer requires six ink cartridges with matte black, photo black and grey inks providing dark blacks and true neutral greys. The other colours include cyan, magenta and yellow. The CIS scanner is sheetfed and the copier can produce up to 99 copies. A front-loading structure makes it easy to switch between two rolls. Drawings can be protected and organised with the built-in output stacking tray of the HP Designjet T2500 36-in PostScript eMultifunction printer. Users can easily copy and scan images or documents with the HP Designjet T2500 large format inkjet printer or print directly from wireless devices. The print speed is fast enough to prevent downtime and get the job done quickly. Better value for money is offered by the high capacity HP Designjet T2500 PostScript ink cartridges which achieve a low cost-per-print. 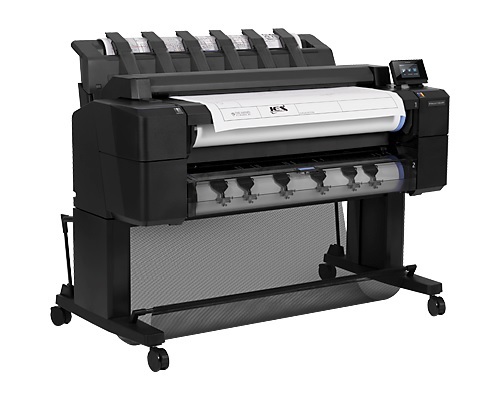 Users need to provide a lot of installation space for the Designjet PostScript T-2500 914mm eMultifunction inkjet printer. It can be difficult to set up because of the heavy and bulky frame. The high initial price and overall running costs are high for the HP Designjet T2500 36-in (914-mm) printer.